Home > Lung Health > What is Pulmonary Tuberculosis and what causes it? Pulmonary Tuberculosis is a contagious bacterial infection caused by TB, or Mycobacterium tuberculosis. Tuberculosis can easily spread from one person to another in the air. When a person has TB in their lungs or throat and laughs, coughs, sneezes, or talks, TB germs can spread into the air. If someone with a weak immune system inhales these germs, they could contract a tuberculosis infection. There is a difference between contracting a TB infection and having TB disease. A person with a healthy immune system that is infected with TB has TB bacteria living in their body. A healthy immune system will protect against these germs to prevent sickness. If someone has TB disease and a weakened immune system, the disease can easily spread to other people. A person with tuberculosis needs to see a doctor as quickly as possible. Fortunately, it is fairly difficult to become infected with TB. In most cases, you would have to spend a large amount of time with a person that has TB disease. TB may spread more easily between friends, family members, and coworkers. TB is spread in enclosed spaces over prolonged periods of time. In order for the disease to develop, tuberculosis bacteria must become pathogenic; a person under stress, eating a poor diet, or with a weakened immune system is more susceptible. Healthy people can become infected with TB, but they are less likely to get sick. It should be your number one goal to become healthy. Home > Lung Health > ¿Qué es la Tuberculosis Pulmonar y qué la causa? 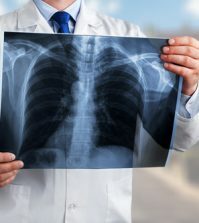 ¿Qué es la Tuberculosis Pulmonar y qué la causa? La tuberculosis pulmonar es una infección bacteriana contagiosa causada por tuberculosis o Mycobacterium tuberculosis. La tuberculosis puede propagarse fácilmente de una persona a otra en el aire. Cuando una persona tiene tuberculosis en los pulmones o la garganta y se ríe, tose, estornuda o habla, los gérmenes de TB pueden propagarse en el aire. Si alguien con un sistema inmune débil inhala estos gérmenes, podría contraer una infección de tuberculosis.